Problems and solutions are interrelated between one another. All sides of every state organ are not free from problems, similarly judiciary part of the state are not free. It has many problems. In this chapter of my research I discuss various problems of the judges and I try to give the overall discussion various problems of the judges in Bangladesh. The area of Bangladesh is 147570 sq. m. but the population of it is about 160 millions. So the density of the population there are many cases are open in every year, most of the cases are family matters. For that reason judges are facing many problems. The delay in litigation is equally known to all and nevertheless it may sound inconsistent with due process of law. The fact remains that the very cases are misused and abused in order to delay cases for an indefinite period and ultimate success in the cause often proves false. Now, law is an effective weapon in the hands of the state to mitigate the social needs by ensuring proper justice in time. Such effort of law is liable if justice fails to mitigate the misery of the mass people due to delay in litigation only and the faith in justice can never be instilled in the mass people if the state doesn’t ensure the speedy process of justice. In the field of justice, delay in litigation is traditionally practiced in our country as like at the same time as denying due process of law. The result is that cases are piled up in all the courts hugely day by day. Basically, the delay in litigation is incredibly practiced in civil courts. A number of causes seem to be responsible for creating this crippling situation in the way of our justice. An attempt has been made here to pinpoint some of the causes and suggest measures to remove them. It also seen that the lawyers may not be ready to argue the case and hence regularly submit ‘time petitions’. So, frequent taking of time by the lawyers must be stopped. Less numbers of the family courts is one of the reasons of multiplicity of the judges. There is no enough family courts room in every district. So lots of cases are pending in every year’s especially family matter. Judges are not available in every Family court. With Family matters lots of cases are open in every day. One judge of every Family court is not able to deal those cases so the multiplicity of the suits is being high day by day. The prevailing family laws are not exhaustive to solve the family suits. It depends on other laws. The purpose of the family Courts Ordinance is to provide for speedy disposal of family matters by the same forum. Provisions made in the Family Courts Ordinance have ousted the jurisdiction of the Magistrate to entertain application for maintenance which is a family court matter. A complete opposite view to the effect is that the Criminal Courts as usual way entertain a case filed under section 488 of the Code of Criminal Procedure for maintenance. To dissolve this issue the Court considered (i) section 3 of the Family Courts Ordinance which provides that the provisions of this Ordinance shall have effect notwithstanding anything contained in any other law for the time being in force, (ii) section 4 which provides that all courts of Assistant Judges shall be the Family Courts for the purpose of this Ordinance, and (ii) section 5 that provides that the Family Courts shall have exclusive jurisdiction to entertain, try and dispose of any suit relating to the subjects enumerated in this section that includes maintenance. The Court held that these sections clearly indicate the ouster of the jurisdiction of other courts in dealing with the matters enumerated in section 5 of the Ordinance. The husband may sue against the wife for restitution of conjugal life if the wife, without lawful cause, ceases to cohabit with her husband. This suit is maintainable only against legally married wife. However, a husband cannot file such a suit if the contract of marriage is dissolved. The expert lawyer on family laws is not available in our country. The lawyers do not want to solve the problem by alternative way. The philosophy of Alternate Dispute Resolution systems is not well to the lawyers as well as to the judges. In a developing country like Bangladesh with major economic reforms under way within the frame-work of rule of law, strategies for swifter resolution of disputes for lessening the burden on the Courts and to provide means for expeditious resolution of disputes, there is no better option but to strive to develop alternative modes of dispute resolution by establishing facilities for providing settlement of disputes through arbitration, conciliation, mediation, negotiation, etc. Litigation does not always lead to a satisfactory result. It is expensive in terms of time and money. A case won or lost in court of law does not change the mindset of the litigants who continue to be adversaries and go on fighting in appeals after appeals. In June 2000, formalized ADR was introduced in Bangladesh by means of court annexed judicial settlement pilot projects, in an effort to decrease delays, expenses, and the frustrations of litigants laboring through the traditional trial process. The pilot program began in a collaborative effort with ISDLS in a series of Bangladeshi legal studies of Californian ADR systems. Three Pilot Family Courts were established in the Dhaka Judgeship, which exclusively used judicial settlement to resolve family cases including: divorce, restitution of conjugal rights, dower, maintenance and custody of children. An amendment to the Code of Civil Procedure was not necessary due to an existing 1985 Family Courts Ordinance, which authorized the trial judge to attempt reconciliation between parties prior to and during trial. 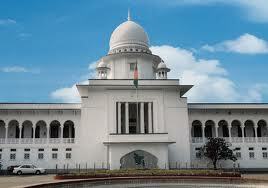 The pilot courts were staffed by 30 Assistant Judges selected from all over Bangladesh, lawyers and non-lawyers, who were given training by a United States mediation expert. During this assignment, the Assistant Judges were relieved of all other formal trial duties107. The dissolution of marriage under Muslim law is detailed in sections 307 and 308. Under Muslim law, the contract of marriage may be dissolved in any one of the following ways: (i) by the husband at his will, without the intervention of the court; (ii) by mutual consent of the husband and wife, without the intervention of the court; (iii) by a judicial decree at the suit of the husband or wife. The wife cannot divorce herself from her husband without his consent unless such right is given to wife in the Nikah Nama. This type of talak is known as talak-e-toufiz. When the divorce is affected by mutual consent, it is called khula or mubara’at according to the terms of the contract between the parties. The dissolution of contract of marriage by the husband at his will without the intervention of the court is called talak. Talak may be oral or in writing. To talak orally husband with sound mind pronounces a few words willfully, which are expressed (saheeh) or well understood as implying divorce, and since pronouncement behaves accordingly. Talak in writing or talaknama is the written document of oral talak. The deed may be executed in the presence of the kazi, or the wife’s father or of other witnesses. However, the deed should be in customary form and properly super scribed and addressed so as to show the name of the writer and person addressed. In Muslim law, the wife too has limited right to divorce her husband judicially. A wife can dissolve the contract of marriage with the intervention of the court on the grounds: (i) the whereabouts of the husband are unknown for a period of four years; (ii) failure of the husband to provide for the maintenance of the wife for a period of two years; (iii) sentence of imprisonment on husband for a period of seven years or more; (iv) failure without reasonable cause to perform marital obligations; (v) impotence of husband; (vi) insanity of husband or his suffering from virulent venereal disease; (vii) repudiation of marriage by wife; (viii) cruelty of husband; and (ix) marriage without her consent. This divorce is called talak-e-taufiz. Only considers problems when they reach the extreme, whereas the extreme stage can be prevented if addressed properly in the primary stages through local level institutions (Ali and Alim, 2005; World Bank-BRAC ongoing research on justice, 2006). However, the local level informal justice institutions and processes are not free of problems. The next section describes the constraints that the poor face when they try to access justice through informal institutions. Still today, most people of rural Bangladesh are unaware of their legal rights. Dowry is a common phenomenon in village and the villagers just do not know that giving or receiving dowry is prohibited by the law. Every now and then, the women come to the NGO legal aid offices to file charge against her husband for battering. In almost all cases, the reason is, failure to pay dowry .The actual meaning of “Denmohor” (dower) is not yet understood by women and most of them failed to collect it in time. For its patriarchal nature, traditional Salish fails to provide justice in these cases and NGOs cannot provide legal help in case of dowry related incidents until they renamed it as “Bhoronposhon” (maintenance). Thus, with a case of different nature, legal aid is provided but the problem of dowry does not end. k) Multiplicity of laws on a particular issue. Family Court Ordinance, 1985 aims at resolving legal disputes related to dissolution of marriage, restitution of conjugal relation, dower, maintenance, and guardianship and custody of children. This Ordinance was promulgated in 1985. The contents selected for consideration in the Ordinance are compiled from Muslim law, hindu law, civil procedure code, Evidence Act, Dissolution of Muslim Marriage Act, and the Muslim family law ordinance. This Ordinance extends to whole of Bangladesh except the hill districts of Rangamati, Khagrachhari and Bandarban. This law provides that all courts of munsifs shall be Family courts and the munsifs shall be the judges of Family courts. Basically Family Courts shall have exclusive jurisdiction to entertain, try and dispose of matters relating to marriage, conjugal relations, dower, maintenance, guardianship and custody of children. Ques: 1: How many family suits are pending at present in your court? On average how many cases are disposed of in your court per year? Ans: The families suits are pending at present in my courts are approximately 1517 cases. On average 800 cases are disposed in my court per year. Ques: 2: What kind of problems a judges faces in the trial of family suit? Qus:3: Are the plaintiffs obtaining proper remedy through family court? Ans: We try to provide the proper judgment about the disputes of family matters of the plaintiff as soon as possible in very short time for our best. Qus: 4: As there any time limit for disposal of a family suit? If the answer is negative, generally how long time does it take? Ans: There is no any time mentioned in the Family Court Ordinance 1985 but in general when the written statement in filed, the family court shall fix a date ordinarily of not more than 30 days for a pre- trial hearing the suit. If no compromise or reconciliation in possible then in general it will take to solve the dispute within 6 or 7 months. But in case of ex-partee decree within 45 days. Qus: 5: how is decree for maintenance/ dower executed? What sort of problems may arise in executing such a decree? Ans: The dependent are given time may be minimum 30/ 35 days for executing of maintenance / dower after the judgment by order of the court. Time mention in the judgment for the execution of dower and maintenance then the court serve the notice to the dependent. If he is unable for the execution after receiving the notice the court shall send him in custody it not more than three months. In this chapter I discuss various types of problems of the judges in family courts and I analysis it with the interview of the family judge.